I recently purchased a Royer R-121 ribbon mic, and while it works fine with my M-Audio 1814 interface, I've been considering a stand-alone preamp for some time, and the new mic gave me the motivation to take the plunge. Before the Royer I was using mainly an Audio-Technica 4033/CL condenser (and I'm still using it quite happily on vocals and acoustic guitar). I'm a home recordist—acoustic and electric guitar, bass, vocals, and simple drum parts. I did a lot of internet research and—surprisingly—I bought the V5, despite very little user feedback available. I hope this review helps others in their preamp decision. I'm not a professional audio engineer, and I have not compared the V5 to other mid-to-high-end preamps, so keep that in mind. Other preamps I considered were the Great River ME-1NV, Grace M101, and Avalon M5. 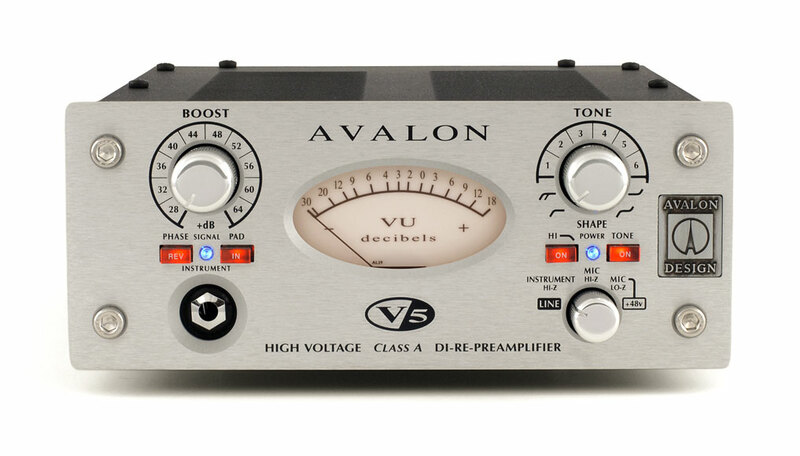 I went with the V5 based on its features, its "newness," its price, the widespread usage of Avalon equipment in the recording industry, and, yes, the ultra-cool VU meter (so pleasing for us geezers to see that old familiar analog response). By newness, I mean that all these other preamps have been around for a long time, and I figured that, given Avalon's reputation and advances in electronics over the last 20 years, the newer design was worth the gamble. I've been using the V5 for only two weeks, but I've put it through its paces. The DI input is wonderful. Recording bass is a dream, with gobs of heaviness. The preset tone filters are very useful because generally I don't want as much low end as the V5 is capable of delivering. They work well and clearly affect the sound. If the bass is a dream, then acoustic guitar into the DI is pure tonal nirvana. I have a Martin HD-28 equipped with an internal Ellipse Blend system (mic and piezo). I've played it through a number of guitar amps and, frankly, it sounded like garbage. I was never happy with it. First time I plugged it into the V5 my jaw dropped. Instant spectacular acoustic sound like Tommy Emmanuel. I've always wondered how the pros did it. Now I know. Record into the DI, copy to another track, pan left and right, apply some reverb, and my goodness it's like nothing I ever imagined. Again, the tone filters are really useful here--#3 in particular with the Martin. The reamping is lots of fun. I can record a clean electric guitar via the DI into Pro Tools, then feed the signal from the computer into the V5 at my leisure and send it on to my guitar amp. The Boost (gain) knob on the V5 can be used to boost the signal being fed to the amp, so you can achieve huge variation in amp tone from clean to highly overdriven. The tone filters can also be used on the output signal. It's so convenient to tweak the guitar amp while simultaneously hearing the sound. The only negative is that in order to record the amplifier, I have to use the old 1814 interface. You can't reamp and record through the V5 at the same time. The DI and reamp are just gravy as far as I'm concerned. What about the mic input? So far it's been all good. A key attraction for me was the dual input impedances, both of which are sufficiently high for the ribbon mic. My other preamp choices were on the edge of what Royer recommends. I've mainly been using the high impedance input for the Royer, and the low for the 4033/CL (which is the only option because phantom power is only available at low impedance), and the fidelity is extremely true to life. Vocals are clear and realistic, and guitar amp tones are reproduced with great accuracy. My impression is that this is a clean preamp indeed, as opposed to a so-called colored preamp (although Avalon's literature describes "low mid-range harmonic content," implying some coloration). Changing the impedance and the EQ (tone shape) settings does produce significant changes in tone, and this is one of the factors which caused me to choose the V5 over the Grace. I haven't explored all the possibilities here. Suffice to say, there is much to investigate. A curious thing to me is that this preamp has a huge amount of gain vs. the 1814. Where I'll have to crank the gain to 75% on the 1814 I seem to need only, say, 30% on the V5. Looking at the specs of the two units they appear similar (e.g., 60dB gain for the 1814 vs. 60/66 dB for the V5), but in use it would appear the V5 has vastly more headroom. By the way, the detented Boost knob is a nice touch; it's easy to come back to a previous setting (not to mention the whole unit is solidly built, and the knob produces such a satisfying click when you turn it). In conclusion, I highly recommend the V5 for its versatility and quality. It has given my creativity a huge push and sparked my enthusiasm considerably (as you may gather from this review).